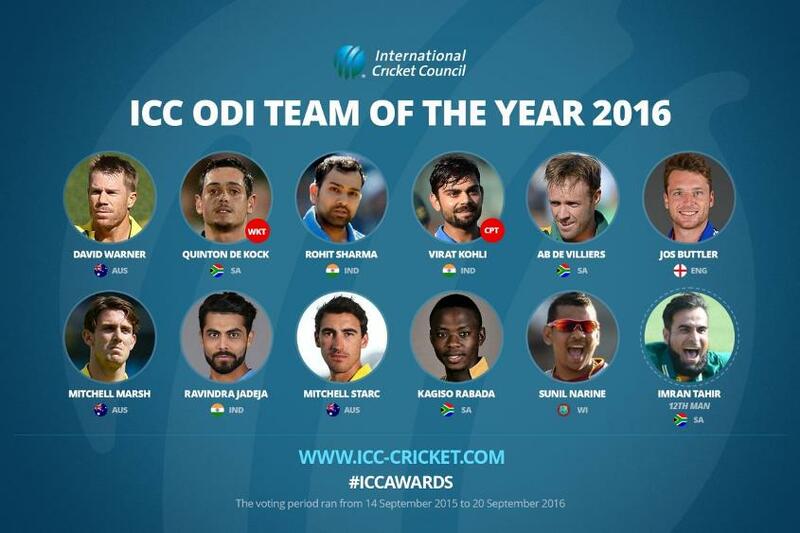 The International Cricket Council (ICC) today announced its Test and ODI Teams of the Year. Former Test stalwarts Rahul Dravid, Gary Kirsten and Kumar Sangakkara selected the sides based on players’ performances in the period from 14 September 2015 to 20 September 2016. England’s Alastair Cook has been named as captain of the ICC Test Team of the Year, which includes four Englishmen, three Australians, and a player each from New Zealand, India, Sri Lanka and South Africa. It has been a case of third time lucky for Virat Kohli who has been named as captain of the ICC ODI Team of the Year, which includes three Australians, Indians, South Africans each, and one each from England and West Indies. De Villiers has been selected for the sixth time since 2010, while Starc has been picked up for the third time in four years.